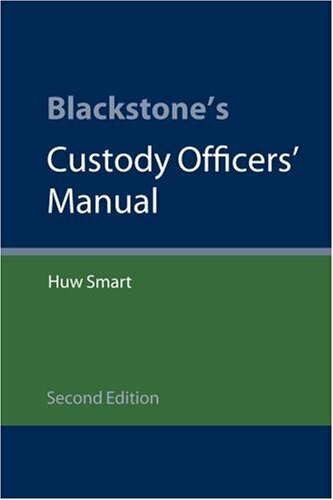 Amazon.com description: Product Description: This new, updated 2nd edition of the popular Blackstone's Custody Officer's Manual provides a practical companion for trainee and established custody officers, containing all relevant legislation together with interpretations of the areas of Codes of Practice that are most commonly misunderstood. It offers a comprehensive treatment of all the elements of the custody officer's role, highlighting common problem areas and offering practical guidance. The new edition has been fully updated to include changes as a result of the Serious Organised Crime and Police Act 2005 such as the civilianisation of the custody officer.